Dilbert Files is a new file transfer service from Scott Adams that lets you send large files on the Internet without having to attach them in an email message.�Once you build a brand on the Internet, you try different ways to build upon that brand. That�s exactly what Scott Adams, creator of the very popular Dilbert comic strip, is trying to do with his new service "Dilbert Files". Dilbert Files lets you send large files on the Internet without having to attach them in an email message. 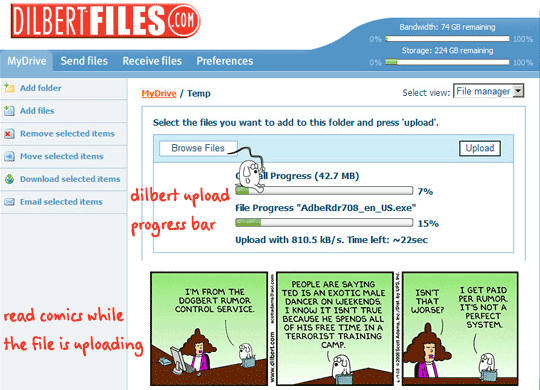 You can either upload the file using the Dilbert app for desktop, through Microsoft Outlook or just use the web browser. And yes, you got that right.� Dilbert Files looks like a clone of existing services like YouSendIt and RapidShare sans any free component. For instance, you need to shell out around $10 per month for sending files up to 250 MB per month. Techies, who know about services like DropBox, Box.net or Windows Live Skydrive, will definitely find the price of Dilbert Files a bit steep but for millions of other Scott fans, this may just be another way to get more of their daily Dilbert dose � you can read coming strips even while the file is uploading. Dilbert cartoons appear in some 2,000 newspapers in 70 countries but as the number of traditional newspapers continues to shrink, Scott Adams says that "this is the sort of thing that will help keep Dilbert free online." Am sure die-hard Dilbert fans won�t be complaining here.